There comes a time when Christians just have to stand up and take the hit. What am I talking about? I’m talking about Christians being different in this world — not to attract attention, not to be subversive and not to be ‘holier than thou.’ I’m talking about standing for the truth of God’s Word which means standing against evil. For years I imagine, you’ve celebrated Halloween to some extent. Perhaps you have children that want to be part of what their friends are all doing — dressing up in devilish little suits and going trick-or-treating. Or maybe you just joined in on the office parties or local pub or bar parties — harmless involvement of course, but you participated. Am I right? So why get on a soapbox about Halloween? Perhaps you don’t realize what it’s all about. Halloween is nothing to laugh about, and if you really knew what it was all about perhaps you’d agree that making fun and participating in it to any degree is not a good Christian witness. What’s the harm you ask? We’re just having fun! We get to dress up in bizarre costumes, eat lots of candy and share candy with others. But wait a minute — what exactly are we celebrating? Oh we’re celebrating nothing. Perhaps that’s true but is participation a good witness anyway? What about educating people to what that holiday (holy day?) symbolizes. God designed and authorized 7 holy days (we get ‘holidays’ from concatenating those two words) for Israel. Each of these is symbolic of what God would do in Christ to redeem the world. Each holiday is significant and teaches man about God’s plan. Pagans invented holidays too. They invented holidays for sun worship, the winter solstice (which we call Christmas now but the gift giving, Santa Clause and the fir tree among other things are all pagan in origin) and the spring equinox (which we call Easter now; Easter is the name of the Greek goddess of fertility and eggs and bunnies are symbols of fertility in Babylonian worship). In Babylon they invented even more holidays. But all of these pagan holidays had and have nothing to do with God and truth. Rather they celebrate pagan rituals and teachings. Lo and behold in 2014 we look at the calendar and we find these same pagan holidays on schedule and being celebrated by — guess who — Christians! Oh they changed the names of course, and they incorporated some Christian elements and teaching into them, but they are still include highly pagan elements and God did not authorize them. So what is all this fuss about Halloween and why do I stand against it and encourage others to as well? Walpurgisnacht is a celebration of witches; you can read about it here if you want: http://en.wikipedia.org/wiki/Walpurgis_Night. Halloween is the second highest day on the Satanic calendar. It’s the celebration of the dead and portrays the dead as being alive now, between heaven and hell as ‘ghosts’ or spirits. Halloween glorifies death, the devil and evil spirits. Make as much fun as you want, but it doesn’t change the intent of the holiday. Even those who side with Halloween’s “Christian origin” should see that it teaches and celebrates things completely false. Did you know babies are sexually abused and sacrificed throughout the world by devil worshipers on Halloween night? Is that something you can have in the back of your mind as you take your children around for trick-or-treat? I’m going to stop here because I think this will mostly fall on deaf ears anyway. I’m making the point that Halloween is a man-made, devil adored holiday that Christians should not participate in. Let me know your thoughts on this matter. Am I going to far? Am I missing something? I’m open to the truth so let me know if my thinking is skewed here or not. You may get laughed at, you may get snubbed and you may get a few disappointed looks, but that’s far less than Jesus went through for you! Maybe it’s not such a big deal but I believe standing for truth is always a big deal in God’s eyes. Christianized pagan holidays are still pagan no matter how they are disguised. Regarding Halloween, the Bible explicitly states the dead are dead until Christ returns and they are raised from the dead so even the ‘Christianized’ version of Halloween is off-base. Let’s stop the devil in his tracks wherever and whenever we have the opportunity to. 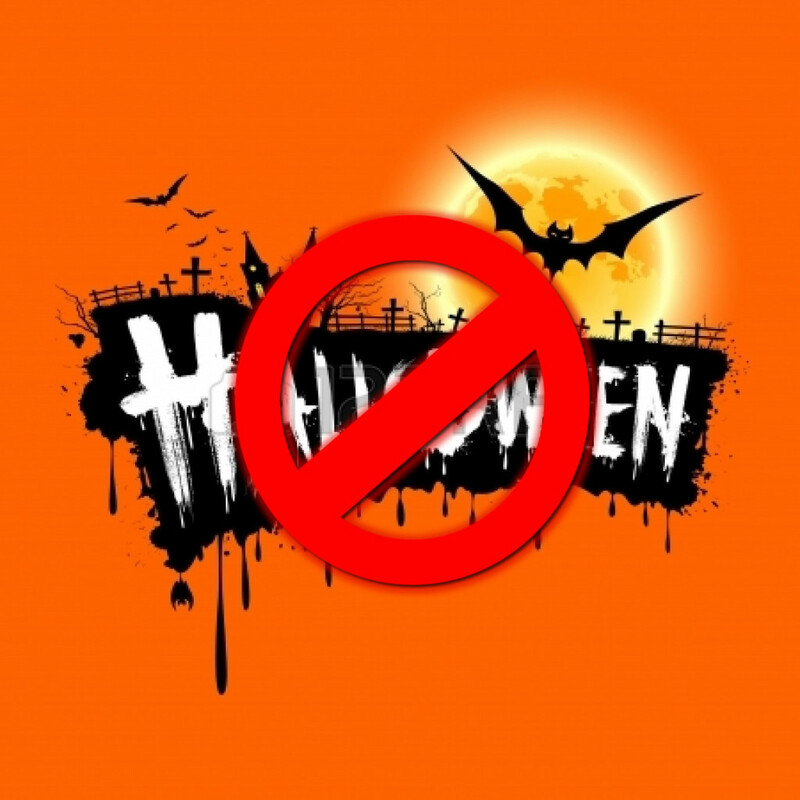 I won’t be celebrating Halloween this year — will you?